As a mobile marketer you must know — your efforts count only if you can measure the results. Otherwise, that’s like giving $1 million to a random man in the street, ask him to build a business for you and expect him to actually do it. If you don’t control what you’re putting your money and efforts into… well, there’s a high risk it will go to the dogs. But you can count yourself lucky — mobile marketing analytics have not been idle and have already outlined the most crucial parameters every mobile app marketer should keep tabs on. It all starts at the beginning ☺ And users’ active interaction with the app begins the moment they install it. In order to measure the effectiveness of your user acquisition efforts, you need to know how many of the users who discovered your app through an ad actually installed it. Of course, driving users to your app and retaining them is what you should aim at. 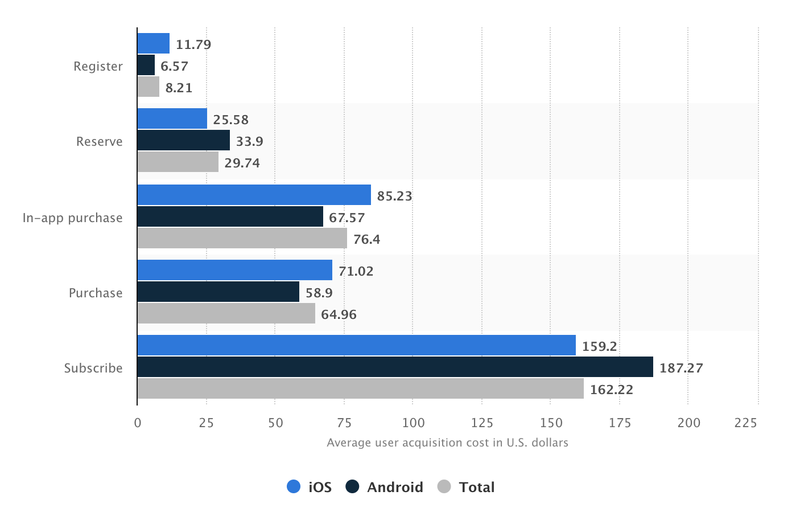 But it’s important to know exactly how much each user cost you. Otherwise, you risk throwing away your UA and Marketing budgets on inefficient activities, especially considering the fact that average user acquisition costs are sky-rocketing. As follows from the title — retention rate indicates how many of the converted users actually kept your app. On average, only 36% of users are still using an app one month after they downloaded it. The time variables in Retention Rate formula may be different. Your aim is to compare the number of users to the date with the number of users you had <1 month><1 month><3 months><#another period> earlier. Just remember to stick to recent time frames — if you attempt to measure the retention rate for the past 12 months — your data will be inconsistent. The most common timeframe to measure retention rate is 90 days (1 business quarter). It’s a well-known fact that the cost of retention is 5 times lower than that of user acquisition. What does that mean to you? First and foremost — that you shouldn’t concentrate your efforts only on acquiring new users. Work hard to keep those who’ve already installed your app. Your Churn Rate (a.k.a. Attrition Rate) relates to the percentage of users who decided to quit using your app, within a particular timeframe. If you’re doing things right, your Churn Rate should be lower than your Growth Rate. Your aim is to keep tabs on such things, collect user feedback and fix any potential churn triggers the moment you discover them. Remember — the longer you can keep users onboard, the more revenue you’ll be able to drive to your app. That’s why one of the most obvious anti-churn actions it increasing your users LTV. LTV (Life Time Value) indicates the value your users bring to you over a period of time. This KPI factors in the frequency of purchases your users make, the value of those purchases, the average time users kept your app and the extent of your app’s virality. The tricky part about LTV is the fact that there is no uniformity in its formula. Each business adds in the variables they deem most important with an obvious condition — the final result must make sense for the business. Why is this indicator so important? Because it not only shows the effectiveness of your UA and marketing efforts but sets up the limit for the expenses you can afford on acquiring one such user. Monthly Active Users metric operates the same variables as DAU within a prolonged period of time — a specific calendar month or a 30-days’ period. This KPI shows you how often your users return to use your app. The major variables in this formula are your DAU divided by the MAU your app generates. And the higher this indicator is, the more engaging is your app. So, you’ve acquired a user, retained them and analyzed how much value they can generate.Time to see how actively they’re using your app. Session Length will show exactly how long a user spends in a session, from open to close. It’s important to understand that here there’s no universal value that would work well for all — 30 seconds in a taxi app is a success, but for a fitness tutorial app that would be a total failure. Average Revenue Per User — or Current LTV — shows the ratio between the lifetime revenue of the app and the number of lifetime users. It will help you understand the value a single user has generated since the app launch. ARPPU, or Average Revenue per Paying User - has the same formula, but calculating the revenue generated per single paying user. Return on Investment is something everyone wants to know but few can get right. To do it well you need to figure out how much exactly you’ve invested in your UA campaigns — and that isn’t just direct campaign funding, but a whole series of parameters — such as paid automation tools, team salaries, design collaterals cost, etc. At Aprofita we strive to create maximum visibility and predictability in terms of campaign KPIs. Due to the specifics of our business model, predicting the outcome of your UA campaigns becomes a matter of one click. Your ROI will automatically be calculated with each new data input. Data review in mobile app marketing and user acquisition is an integral part of your growth strategy. Timely collection and real-time analysis of various parameters and metrics allow mobile marketers and user acquisition professionals to react to the slightest fluctuations in user behavior. The number of such parameters and the numerous variables within them may be confusing at the first glance. That’s why it’s important for all app marketing beginners to start keeping track of the most basic KPIs, understand how they work and turn these metrics into their best allies in forming app marketing performance analysis.